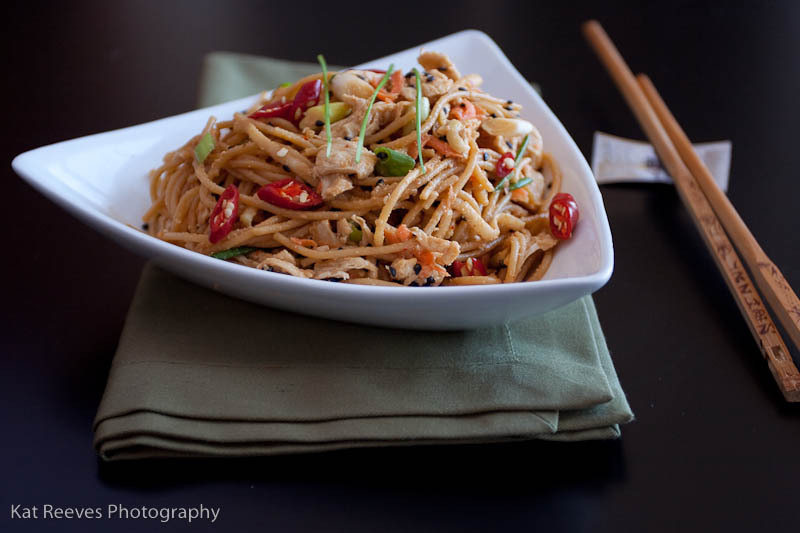 I cannot tell a lie: this is one of my favorite noodle recipes to eat. It’s not because I love peanut butter, and ginger, and sesame. It’s not because I love that you can make this as spicy or as mild as you like. It’s not because it’s super easy, although all those things are nice too. It’s really because every time I make it, it’s a little different. Depending on what fresh ingredients I have in my fridge or growing in my herb garden, I can always change it up a little, and it always tastes amazing and fresh. And because of that, it’s easy to customize the recipe to include ingredients that you love, so that you can make it just the way you like it. Like a little extra heat? Just go for the max number of thai chilis. Like it a little milder? Seed one jalapeno and use that instead. Hate carrots? Leave ’em out. Crazy for ginger? Up the quantity to two tablespoons…. 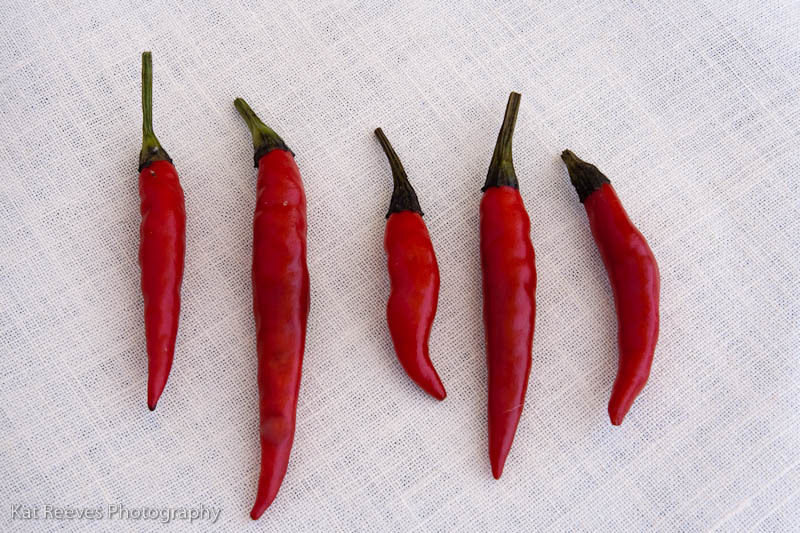 TIP: Smaller chilis are more potent than larger chilis of the same variety. Chilis grown in a hotter, more humid climate are spicier than those grown in a cool, dry climate. TIP: If using the optional vegetarian “chicken,” read ingredients carefully before you buy to make sure that your variety is vegan. Also, look for brands that are made in the USA; brands made in taiwan or china may not include all ingredients on the label, and may not be vegetarian at all. If I am using vegetarian “chicken,” I go to my local asian mega-mart and look there. They carry US brands, and they are typically much cheaper than popular grocery store brands such as Morningstar Farms. 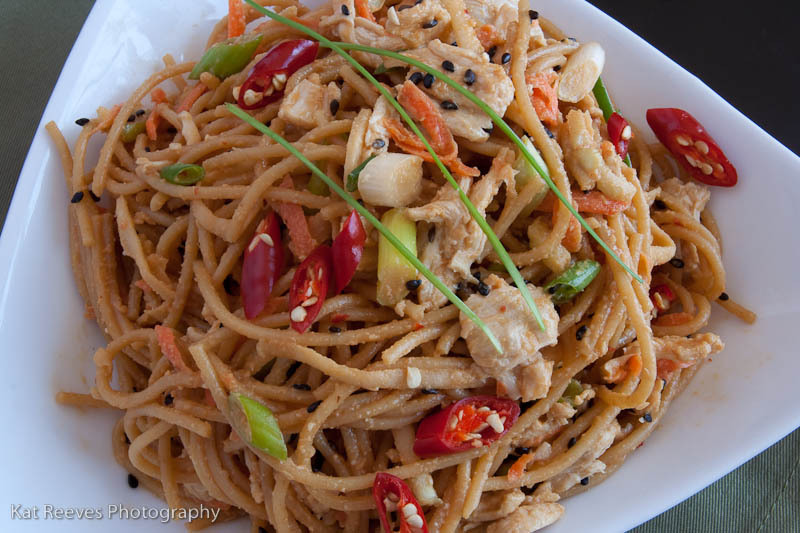 What other fresh ingredients would YOU add to these noodles? 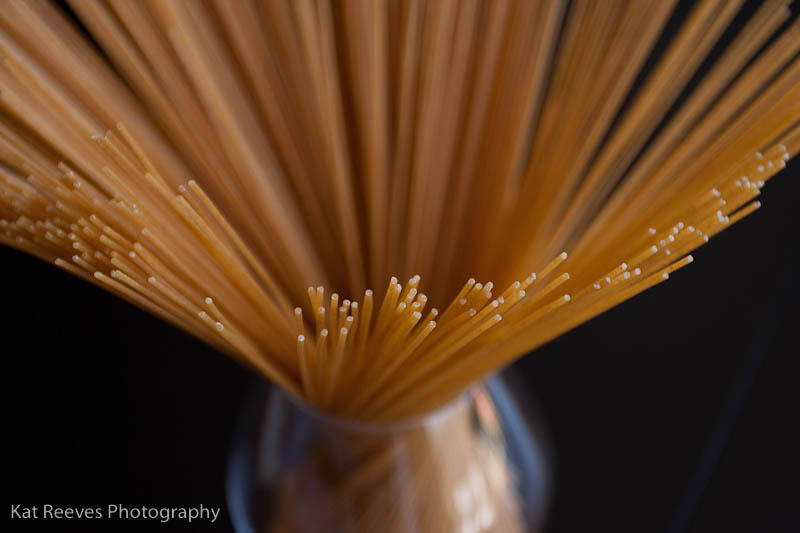 Break spaghetti in half before cooking (this will make it easier to distribute the rest of the ingredients evenly at the end). Cook pasta to al dente in salted water according to package directions. Drain, and place in a very large bowl. Add toasted sesame oil to the pasta, and use tongs to toss the spaghetti in the oil; this will keep it from sticking. Meanwhile, place 1/4 cup sesame seeds in a dry pan, and toast over medium heat until aromatic and just starting to brown a little. Set aside to cool a little bit. Place peanut butter, garlic, ginger, soy sauce, rice vinegar, chilis or hot sauce, brown sugar, and toasted sesame seeds into your blender. Blend until smooth. Add water 1 tablespoon at a time, until the mixture is the consistency of cream. Pour the dressing over the noodles. Add the black sesame seeds, carrots, spring onions, veggie chicken, and any other veggies or herbs to the bowl. Use tongs to toss. Serve room temperature or cold. Even though we are married and see each other every day, Will and I still try to have a date night at least once a week; we’re both pretty busy people and it’s nice to have some time that is dedicated for us to just relax together and really talk. One of our favorite date night things to do is make mini-pizzas together. This is really fun because we each prepare our pizzas side by side, share toppings, fling sauce at each other, and comment on how we each choose to arrange our toppings. Into the oven they go… Then we pull them out, swoon over how beautiful our pizzas are, and sit down together to eat. We are never disappointed, because the beauty of mini-pizzas is that we each get make our pizza exactly the way we like it! As if having a fun and tasty activity with your S.O. wasn’t good enough, it gets better…the crust is FAST and EASY. And it’s got whole wheat flour in it. And delicious herbs. And even though it has yeast in it, it only needs to rise for 15-20 minutes, which I’ve found is just enough time to prepare the toppings. Here’s another great thing about the dough recipe, you can easily double or triple it for a crowd. Or double it, portion it, and refrigerate or freeze whatever you don’t use. Just remember that if you are going to store it, you should coat the inside of a zip top bag with cooking spray or a thin coat of cooking oil to make dough retrieval a snap. 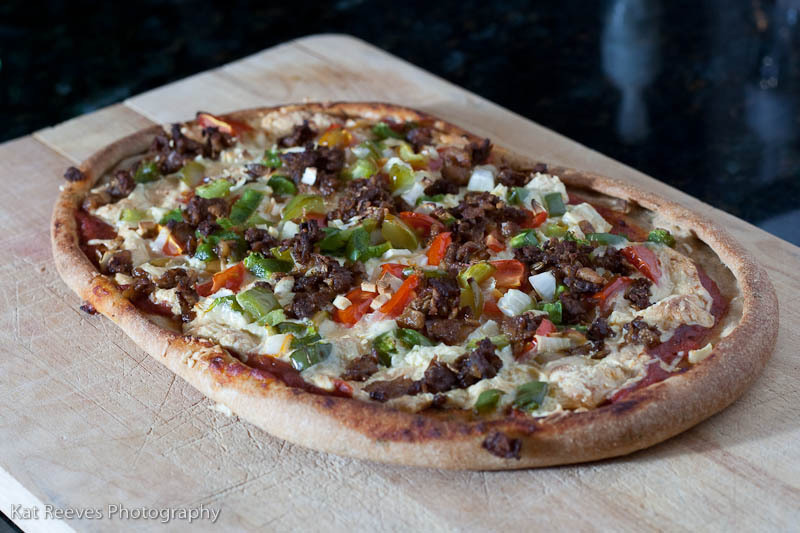 TIP: You don’t really need any special equipment for this recipe, but a pizza stone is really going to make a huge difference in the quality of your crust, especially if you like a crispy crust. I would definitely recommend using one if you can. Toppings are limited only by your imagination. 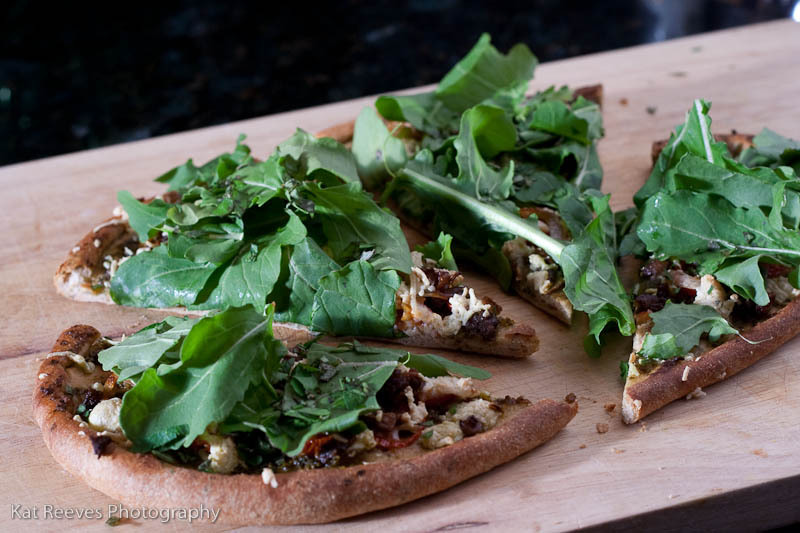 Mini-pizzas are a great way to use up little odds and ends of produce that may be accumulating in your fridge. 1/8 of an onion? Slice it up. One lonely jalapeño? Adds some zing. Will tends to like tomato sauce, onions, bell peppers, jalapenos, and daiya cheese on his pizza; he is pretty consistent. I like to try different things, so this week’s pizza was topped with pesto, daiya cheese, sauteed onions and garlic, and veggie sausage crumbles; I also put a big handful of torn arugula on top when the pizza was hot out of the oven. YUM! What kind of toppings do you like on your pizza? In your mixer’s bowl, combine AP flour, whole wheat flour, yeast, and salt and stir. Add water and agave nectar, and mix until smooth. Switch to the dough hook and knead on low speed until smooth and elastic, about 3 minutes (–OR– knead by hand on a floured surface, 5minutes), adding whole wheat flour 1 tablespoon at a time if dough sticks. 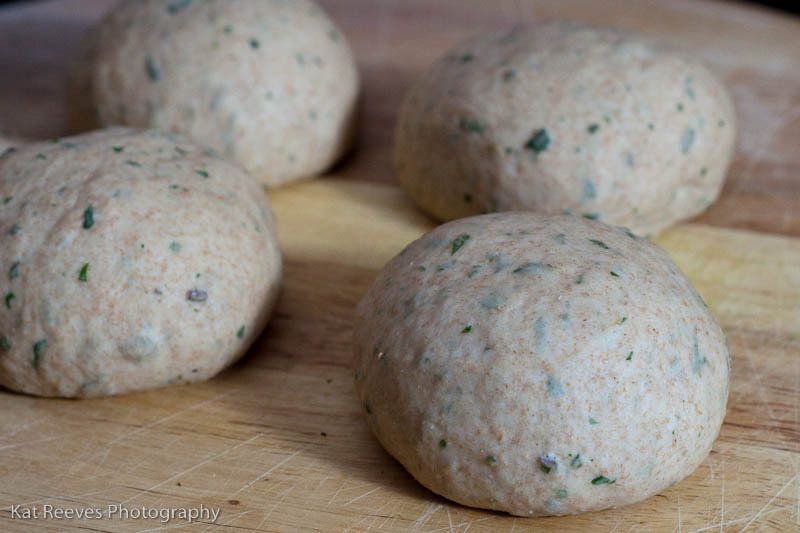 Using a bench knife or sharp chef’s knife, cut the dough in half and shape it into smooth balls. Invert your mixing bowl over one, and place another deep bowl (or piece of lightly oiled plastic wrap) over the other and let rest 15 minutes. Stretch or roll or toss each dough ball into desired shape and place on parchment paper (or a baking sheet, if you are not using a pizza stone). Turn over a small lip all around the edges and seal with your fingertip by pressing slightly. Have fun with toppings. Cook in preheated oven for 12-15 minutes, or until dough is browned around edges and as crisp as you like it. One of the cool things about doing a CSA is that from time to time something shows up in your share that you’ve never seen before. This week for me, it was kohlrabi. If you’ve never tasted it, kohlrabi has a very mild, pleasant flavor. I found it to be kind of cabbagey tasting, in a very good way. It also has a very satisfying crunch which reminds me of broccoli. Apparently when kohlrabi is very young, you can eat it without having to peel it. But the outer layer of the large specimen we got was fibrous and tough, and it definitely needed to be peeled. Our share this week also contained a bunch of turnips, and I had some left over carrots from the farmers market too. In light of this, I figured it was slaw time. The dressing on this slaw is one that I use all the time with a shredded cabbage base, so feel free to sub in about a half of a head of cabbage if kohlrabi and turnips aren’t your thing. This makes about 6-8 cups of slaw. When I’ve made (the cabbage version of) this in the past, I’ve often doubled it because it’s so tasty, and it does not last long in our house! Whisk together all ingredients except for the onion (you can also use a blender for this). Pour the dressing over the sliced onion in a large bowl, and set aside for half an hour to let the onions macerate slightly in the liquid. Stir occasionally. If your turnips still have their green tops attached, cut them off and set them aside for another use. Peel and trim all the veggies. A food processor with the disk for shredding works best for the veggies. Shred all the veggies, and add them to the bowl with the onions and dressing. Add the sesame seeds, mint leaves, and “chick’n” strips and other herbs (if using). Toss the slaw to coat with dressing. Garnish with extra sesame seeds and herbs. Serve right away, or tuck it into the fridge until you are ready. This lasts about 4 or 5 days in the fridge, but is best the day it’s made.